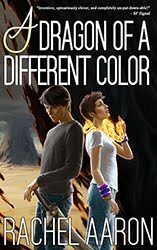 Yesterday, I got an email from Amazon offering Nice Dragons Finish Last a potential spot in the upcoming Kindle Big Deal. I participated once before in November, and we were generally happy with the results, so I was excited to do it again. BUT (you knew that was coming, right?) there was a catch this time, because with the second dragons book nearly ready to go (yay! ), I'd been aiming to apply for a Bookbub ad during this same period. At the moment, Bookbub is considered the gold standard in book advertising if you're self-published, or even traditionally published given how many NY titles they feature, but it's expensive and tricky to get in. There are no guarantees they'll accept you. Also, if you're going to do a Bookbub ad, your book can't have gone on sale for a lower price during a set period of time before your Bookbub ad, which would pretty much write out participating in the Kindle Big Deal. Now, I realize of course that this situation is an embarrassment of riches. I am exceedingly lucky to have a good chance at participating in either of these promotions, let alone both. Luck aside, though, I still had to make a decision, so I did what I always do in times of overwhelming detail: I turned to my husband, business manager, and all around amazing dude Travis and asked him to look at the numbers and figure out the best strategy. I expected a simple yes or no answer. As usual, though, Travis blew me away, sending me an amazing email chock full of information and graphs! (Can you see why I married him?!) The email was actually so good, I asked him to turn it into a guest blog post because 1) I thought you guys would be interested to see some real world book advertising results/decisions, and 2) the post I was going to write on managing multiple POVs in a novel is only a third done and it's already Thursday. I know the blog has been pretty business heavy of late, but hey! Writing is a business. I promise we'll get back to the craft posts soon, but for now, here is Travis to give you an inside look at the kind of business decisions you have to make as a working author (and save my blogging bacon). First, thank you for all the concern and well-wishing for my health. Its been a harsh winter of hospital visits for me. I'm getting better, though! Definitely hoping for no more ER visits this year. Any more and we're going to start wondering if I'm under a gypsy curse or something. I didn't withhold my bread from any old women in forests, I swear! Anyway, today Rachel told me that she's been offered participation in the April Kindle Big Deal. This is pretty awesome, but I've been wanting to try out Bookbub as well. So, in the spirit of this blog (showing how the sausage is made), I'd like to share with you all the business analysis and decision making process Rachel and I went through and which marketing venue we ultimately decided to go with. No details will be spared, you've been warned ^_^. First consideration - Can we have our cake and eat it too? I think doing both Bookbub and the Big Deal at the same time is a bad idea. It would be super hard or impossible to set things up such that we could tell how many sales were contributed from the one or the other. Since we have never done Bookbub, this would make it so that we get almost no data and waste a precious evaluation chance. The next time I wanted to promote, I'd have no idea if Bookbub had worked or not. And....that's pretty much the death of attempting to do both simultaneously, or even close together. To get good data, I need prices to be regular for at least a month before running a sale. Also, I don't think it's good for a book to be on sale all the time. Its not fair to people who buy at regular price and it calls into question the true price of the book. So, its gonna have to be one or the other. For spring anyway. Pros: We set pricing, we have influence over the promotion window, fairly solid known results, hopefully reaches some new people than our usual Amazon audience. This comparison is what made me question whether or not we should do the Kindle Big Deal this time around. My gut feeling was the Bookbub might be a better use of our time. I've heard so many great things about it, after all. In the end, though, a pro and con list isn't very objective since even one great pro could outweigh many small cons. Its hard to tell which are going to be which. At this point, Rachel and I needed to talk strategy. Were we cool with staying in KDP until summer? Turns out the answer is, "yes". We both agree that KU borrows are still too important for the book's sales rank to lose. We'd give up about $500/month if we gave up KU. Given that B&N + Kobo amounted for only about $150/month (during release month, no less), it doesn't seem wise to go there yet. We also discussed sale pricing. Amazon could mark the book down to $0.99 or $1.99 or whatever. The lack of control there is an element of risk. If Amazon puts the book for $0.99, we'd have to sell almost 5x the volume lest we lose money on the deal. With Bookbub, we don't have this worry as we would pick the sale price that would get us the best return on investment. Sadly, I don't have good data yet on how a sale on book #1 affects books #2 and so on. Its hard for me to determine the long tail effect and that's the kind of info I want going into a situation where we might lose money. Ultimately though, the sequel to Nice Dragons Finish Last will hopefully be out by April and we will care more about the volume of books sold by a sale than by how much it earned. Third Consideration - How many books do we think each sale will move? After the above, it's clear the question of "How many books did the last Kindle Big Deal sell?" has become critical to the discussion. This is right up my alley, fortunately. First, I looked at our KDP reports (using a handy free KDP graph making tool some awesome programmer built ^_~). The last Kindle Big Deal ran from Nov 7th to Nov 23rd. You can easily see that November is not like the other months. This is great, but I wanted to know how many more books we sold because of the KBD. I noticed that each month, sales were generally falling by ~50%. This is a nice, predictable, curve and I used it to get my number. So, I came up with a simple extrapolation to remove the sale's benefits. Is this perfect? Well, no, but it shows two interesting things. 1) KBD resulted in roughly 2700 additional net sales and borrows than we would have otherwise not made. 2) The extra visibility generated by the sale provided a faint, but tangible, overall boost in sales for the two months following. These are the kinds of relationships that you just can't get without rolling around in the numbers and looking at everything you can. I'm very pleased to have found this tid-bit. Lastly, I brought up the day-by-day sales data that I'd saved back then. Here's the rather interesting chart that came out of it. This made me all big-eyed O_O. Normally KU borrows run about 50% of total volume. Here we could see that borrows barely went up at all during the sale. Its safe to say that nearly all (80-90%) of those 2700 extra books were sales, not borrows! Though, at $1.99 the difference between a sale and a borrow is about $0.09 depending on Amazon's whimsical KDP payout system. Since we don't have any personal data from Bookbub yet, we were forced to use what they so kindly provide. I can't tell you how badly I wish that this kind of info was standard issue for every book promotion site. But ALAS, there's no urban fantasy category.... So I decided to run the numbers on a Science Fiction promotion. I hope I'm not horribly wrong! Now, I figure that Bookbub promotions might have a higher KU borrow rate since it reaches a more diverse audience than the Kindle Big Deal does. This is just a guess, I could be really wrong. For our scenario, though, the borrow rate doesn't make a very big difference, so I'm not worried. What I really want to know is how many books are 'lost' to the listing cost for getting onto Bookbub (ie, how many books would we have to sell to cover the $600 cost and still net out). If I know this number, then I can determine how it'll stack up to KBD. Though things are already not looking good. So an estimated 441 books to break even when running a $1.99 sale. In order for Boobbub to be 'better' than KBD, it needs to present a solid chance at selling more books. Since it starts at -441 books just to cover the fees, that's basically 2700 + 441 = 3141 books just to be "as effective" as the free to participate Kindle Big Deal. I'm pretty sure the ranges given by Bookbub are statistical bell curves. This means that probably only 2-4% of people sell only 260 books or 4200 books. People who sell less than 260 or more than 4200 are likely in the less than 1% range. (Remember, this isn't a free book Bookbub promotion, those can move tens of thousands of books). Remember, for Bookbub to compete with the KBD, we need to sell at least 3141 books. If we assume Nice Dragons is not a special snowflake (always a good assumption) and will perform along the "average" curve of a Bookbub promoted title, that means we have a less than 10% of selling enough books to beat out the KBD. Statistically speaking, it's not looking good. Rachel Note: One thing Trav doesn't mention here is the Amazon rank advantage of Bookbub, which gives you all your sales in one day, thus spiking your rank, vs. the KBD, which spreads sales out over a month. Given this, my gut instinct is that Bookbub actually sells more books than is reported above given the visibility boost of a low rank. I've seen plenty of books who got to the top 100 thanks to a Bookbub promo and just stayed there thanks to the power of the Amazon algos. But these stories are anecdotal and I have no data to back them up, so we can't really use them in a numbers analysis. Still, just wanted to throw that out there! Each Bookbub ad email is only sent out once, but there's also an ad that hangs around for some time on the Bookbub website. We're comparing the sale effectiveness from a 21 day promotion vs a 1-shot + some days promotion. 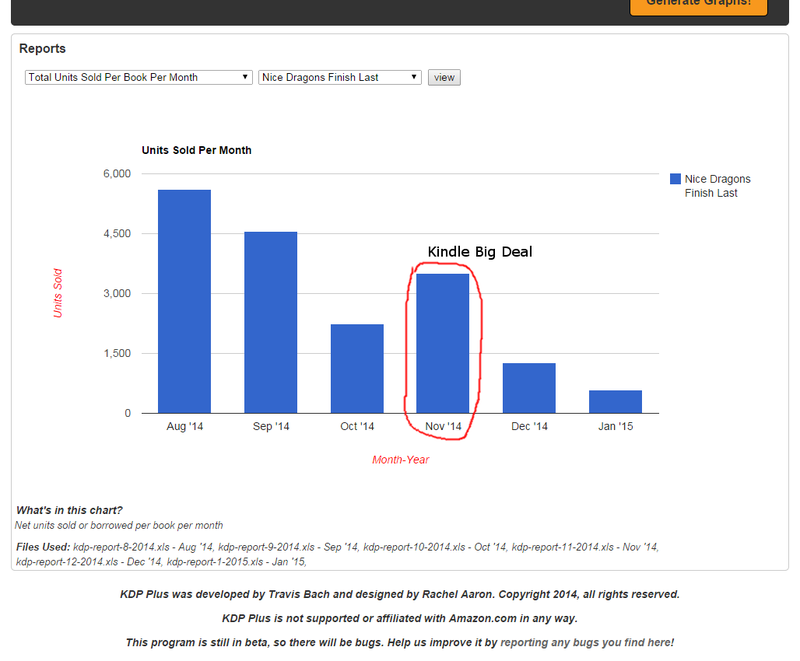 Bookbub sells more per day than KBD probably can, that much seems evident in our data. Duration of the individual sale doesn't really matter so much to us right now, though. Most avertising sites require 60-days since the last sale to consider you for promotion. This large time blocking is what started this whole analysis in the first place. There is one concern, though. There's a big earnings difference between $1.99 for 7 days and $1.99 for 21 days. Despite extra volume, its pretty easy to lose money when royalties go from $3.49 per sale to $1.39 per sale. As I mentioned before, I want to know what I'm paying for and, possibly, what it bought. At this point, I think I've figured out what I'm paying for, so the last consideration would be the hidden costs of running these promotions. Unfortunately, I've not really been able to figure this part out. Thankfully, in this case, I don't really need to. What I do know is that in November 2014, Nice Dragons earned about $2500 more than it should have. Our monthly Nice Dragon's earnings chart looks just like that KDPplus chart I showed you earlier. There's this smooth downward curve and then - BUMP - up shoots November. $2500 as our hopeful earning potential for a KBD promotion. That's ~2600 extra books, which is close-ish to the 1600 books Bookbub's site lists as the average number of sales for the SF genre. Even so, we'd have to outperform the average pretty solidly to make Bookbub better, and while I believe in Rachel's books, statistically speaking it's just unlikely to happen, which is a pity. In the end, we've decided to go with another Kindle Big Deal this time. 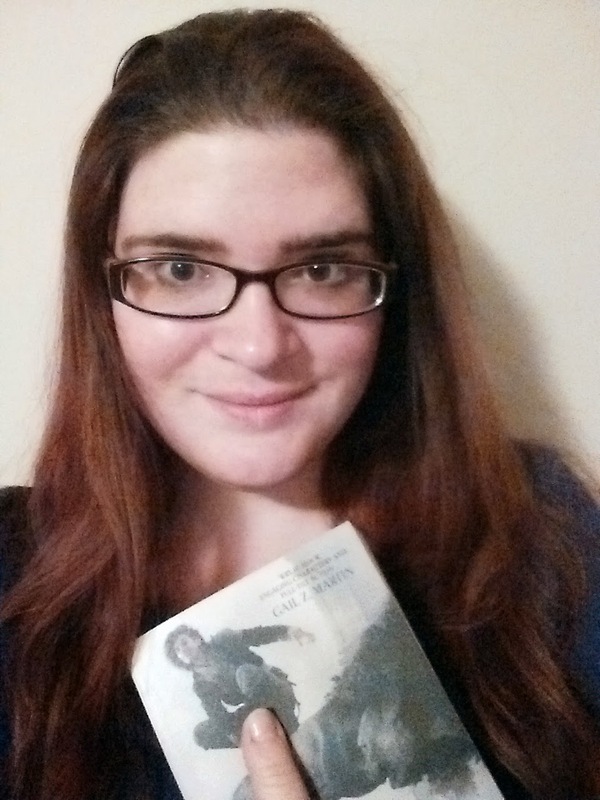 Do I lament waiting longer to try Bookbub? Of course. Right now, though, we can't really afford to gamble. There's so many "mights" and "possiblies" and "if things go really well" with the Bookbub scenario compared to the KBD scenario that it just can't hold up. Maybe we're giving up on something that would have been really awesome. Maybe, if we try and get into Bookbub in the summer or fall, we'll get crazy sales and discover we were fools to make this post and these decisions. I can only hope. In the meantime, though, we've thoroughly weighed all our options and we've combed through as much data to make the best educated guesses we possibly can. I feel confident that, even if we don't make the optimal decision, we're still making an informed and well-considered one, which is the best we can hope for. Rachel again! Thanks to Travis for writing all this and thanks to you for reading it! I hope you enjoyed the numbers and analysis. I'll be back next week with that post on POV management (one of my favorite topics, as anyone who's read my books can tell you). This is an interesting insight. Thank you. Given that you (or I) can't control when Kindle offers you a deal -- who would pass that up? Why risk missing out when you know great sales occur and it's free? Having said this: My experience with Bookbub (via the Fantasy, Horror, Supernatural Suspense, and Thriller lists over a two year period) is that there is a 3-4 month echo of Bookbub's promo when the book returns to regular price (after the bub week) and then proceeds to out-perform what it had been doing at regular price for several months prior to the bub. I've priced most bookbub promos at 99 cents. I tried once at 1.99, and financially it was fine but did not produce said echo effect not did it get near or into the top 100 on any site -- the way the 99 cent ones all have done. I've found that the Bookbub promo is usually paid back within the first hour of sales. My sales there during the Bookbub period tends to be in the 2500-4200 copy ranges (pretty much on any of these lists.) The period for my online bookstore promos is usually 5 days. Additionally, one thing you're not necessarily taking into account is the chance that there's a slightly different audience that Bookbub might bring to your books. Regarding KU: it's too bad that exclusivity is part of that deal, since I often find that 45% of my monthly sales come from Nook, Kobo, iBooks and Google Play. But everybody's experience is different. And maybe I'm dramatically missing out by not being in KU; philosophically, I'm not again subscriptions or lower royalties from borrows, but against exclusivity. I want readers using any device to be able to find my ebooks wherever they want to find them. Still, I like the idea of KU, but I'd hate to lose those readers and I don't believe I'm important enough in the world to request that they come to one particular retailer only to get my book when I can easily upload it elsewhere. I'll also add that Nook, despite the fact that it doesn't seem to promote a lot of its indie-published ebooks, has a healthy genre readership and constantly surprises me with growing sales. Two years ago, this didn't seem to be the case. And yet I don't see any promo they're doing, so this is all about their ebook reader base. All these other outlets have grown a bit -- with Kobo doing promotions for indie books (and rapidly jumping my books' sales there, which tend to be mostly in Canada and the U.K.) and it looks like Apple is picking up, too. Still, I'm sure it's hard to pass up a major Kindle promo. I'm not sure I'd have the strength to do that. In fact, I wouldn't. So I'd guess you'll try a Bookbub a few months after the Kindle deal you're getting and see how it benefits your book. It's worth experimenting. The fantasy list in particular is a great one, in terms of the potential for sales. Well, I'm guessing the more specific you can get in matching the genre and the Bookbub list, the better the sales. And again, despite the great spike I've had on Bookbub day, the real effect I've found occurs during the months after the promo. Still, as with everything, it's always a risk. One of my early "again"s here should be an "against" -- in the "I'm not again(st) subscriptions..."
I enjoyed this analysis. Agree that the bird in the hand is a safe choice. Bookbub's wild success stories seem to be in the Romance genre, which has lots of readers. That's why I think that the point Douglas made about Bookbub getting you new sales is something to consider. I buy at least 50 ebooks a year from Amazon and Google Play and I've never heard of bookbub. Thanks for your very thorough posts! Can I just say that I LOVE how many business posts you've been doing. As a new self-pub author, I love your transparency and willingness to share you thoughts and findings! great post, as usual! I've not heard of either Kindle Big Deal or BookBub before, but will have a closer look now. I'm not a writer, but I find these posts fascinating. The most important thing about this post though IMHO, is that it confirms that the new dragons book will be out next month! I'm one of the readers that discovered you through the last Big Deal. I'm totally hooked and have been stalking your blog waiting for news on the new book. Best wishes on getting it out there and on Travis shaking off the medical problems/gypsy curse. As an Economics instructor, let me just say that any husband who uses 'opportunity cost' in his guest blog post is a keeper!! Thank you so much for asking him to contribute. I love reading about all the behind-the-scenes decision points. This was a very informative post. I am neither a writer, nor an economist…but I thoroughly enjoyed it. I hope that things work out for you, either way you go. I, personally just buy books using iBookstore (though I have, in the past bought books on the Kindle app [less than five books]). I have bought over 200 books on iBookstore (three of them were the Paradox Series). I have used Bookbub in the past in buying books when they go on sale. So, will be looking for your sale (eventually) on Bookbub. Again, thank you for this post. Best of luck. Just to add to the discussion. While I've gotten hooked on lots of series from a Bookbub promotion The only books I've directly *paid* for are books that I already have the hardcover version and pick up a sale for the eBook. I buy a *lot* of KBD books though. I'm a HUGE fan of the Eli Monpress series but those were consumed and eaten to the crumbs long ago. JUST SO HAPPENED on the new Heartstriker series on my Kindle unlimited and cannot wait for #2 which I imagine i will purchase at full kindle price. It also led me to the other series and although the kindle price is a bit high at over $9 I'll probably get it because I liked the last book so damn much. So...good marketing choice. It is weird cause there is a lot of dreck on the kindle unlimited. It is a fascinating insight as to how this all goes down from one's kitchen it seems! Thank you for your wonderful stories :) and yes, your husband rocks.